WARNING: Read at your own risk. This post includes SPOILERS. I once took one of those screenwriting seminars with Robert McKee. You know, the guy Brian Cox plays in Adaptation (2003). Yeah, that guy is real. And he makes loud pronouncements in life much the same way he does in Spike Jonze's film. Subscribe too closely to his inspiring platitudes and you run the risk of producing a very mainstream commercial script, which I guess is the point since this seminar purports to help you write a script that sells. A lot of his admonitions are common sense, just put in a context which doesn't often come to mind. One of those bits of guidance involves what he calls "turning." To hold a story's audience, the story must "turn." Frequently. I think screenwriter William Goldman refers to it as the "reversal." Goldman uses an example of it in his fascinating book, Adventures in the Screen Trade. He talks of the scene in Butch Cassidy and the Sundance Kid (1969) in which Katharine Ross walks into her home at night to find Robert Redford waiting in the shadows with his gun drawn. She freezes, and he makes some sexually threatening remarks as he orders her to undress. She begins to do so, and there is some phallic business with the gun (stuff that wouldn't play so well today, admittedly). While it is initially disturbing to see our hero behave like a deviant, a lot of this is defused when Ross finally says, "Know what I wish? That once you'd get here on time." The reversal, turn, or twist as I'll refer to it, is what draws you in. And the most masterful directors know when and how to employ the twist to maximum dramatic effect. Long before M. Night Shyamalan robbed the "climactic" twist of its power by fashioning a career relying on it, director William Friedkin made what has become a cult classic that completely depends on it for the film to succeed. 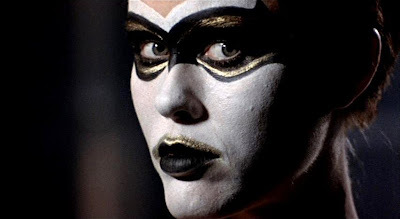 To Live and Die in L.A. (1985) plays like your typical eighties cop thriller for roughly 105 of its tight 116 minutes. Most of it is rife with cliches: a Secret Service agent's obsessive pursuit of a counterfeiter (Willem Dafoe); his questionable methods, dangerous not only to his partner (John Pankow) but to innocent bystanders as well; his unethical relationship with a hot CI (Darlanne Fluegel). If it weren't for the interesting tweaks like the slick Miami Vice-like cinematography by Robby Muller, a surprisingly classic soundtrack by Wang Chung, and Friedkin's often subliminal inserts (as in The Exorcist ), the movie would play like warmed over French Connection (1971). But the last minute twist of hero William L. Petersen's demise-by-gigantic-shotgun-hole-to-the-head instantly reframes his character's relentless hunt as the self-centered, addictive search of an adrenaline junkie looking for his next fix. Watch the film again immediately after you finish it, and you'll see Friedkin doesn't cheat. He loads the movie with foreshadowing, but you're so conditioned to accept the way such films usually turn out you ignore all the clues. The Last King of Scotland (2006) brings its shocking twist in a little earlier. 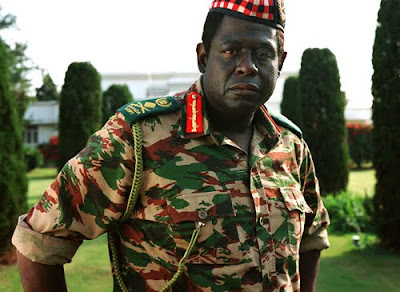 If you know your history, it's no surprise the often congenial Ugandan dictator Idi Amin (Forest Whitaker) is more paranoid than he initially lets on to his Scottish sycophant, Nick Garrigan (James McAvoy). But a dumb affair with one of Amin's wives, Kay (Kerry Washington) serves to wake Nick up to the true danger of Amin while he is perched precariously at the top of Ugandan govenment. After Kay becomes pregnant, and is unable to find a safe way to terminate the pregnancy without Amin's knowledge, she risks going to local tribesmen. Nick is too late to stop her, instead finding her naked corpse, its arms and legs chopped off and sewn back onto the corpse in reverse. The gruesome shot of the body only appears in the film for a few frames, but it is enough to supercharge the movie as it heads towards its conclusion. A little research, however, reveals that the film's implication that Amin butchered his wife is not concrete. Speculation is that she died as a result of the botched abortion, and was dismembered by her lover (another doctor, not the fictional Garrigan) in order to make the disposal of her body easier. Criterion's newest release, the Oscar-nominated Revanche (2008) by Götz Spielmann, gives us a twist on the twist. Rather than save it for its last act, it is the motivating factor that propels the protagonist into the moral dilemma that occupies the majority of the film. Its early scenes seem to set up a tale of moral compromises involving the Ukrainian prostitute Tamara(Irina Potapenko) and her good-hearted lover, ex-con Alex (Johannes Krisch) who decide to rob a bank in order to escape their bleak life in the slums of Vienna. Though Alex doesn't even load his gun for the robbery, keeping his promise to Tamara to avoid violence, the same can't be said about the cop (Andreas Lust) the couple runs into as they make their getaway. A faulty aim as the cop fires at the getaway car changes the dynamic of the whole film from a banal lovers-on-the-lam story to a meditation on fate, culpability, and coincidence still haunting me over a week after I first saw it.